I sometimes hate snow and sometimes love snow. It usually depends on whether I have groceries in the house. 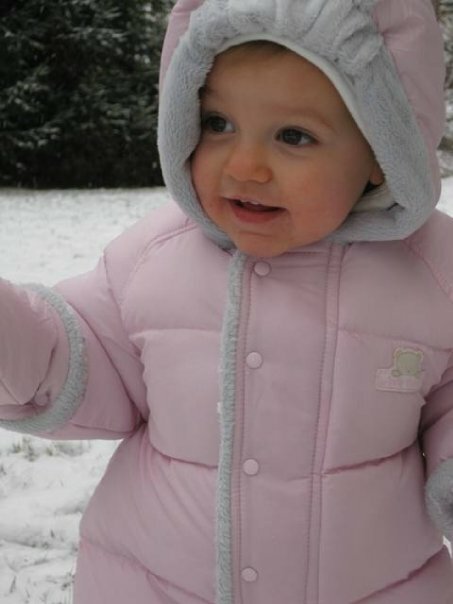 I especially loved snow when my daughter emailed photos of Claire in her Michelin Man snowsuit. Saturday was the first time she’d really seen the stuff since she was too little last year to play outside. It made me happy despite the fact I hadn’t seen her in real life in almost two weeks. Claire lives just 75 minutes from me, but snow has kept us apart and has left me, in many ways, unhappy. But today there was a break in the weather and I trekked down to Pittsburgh in the morning and left behind my workout plans. Plans, shmans. My body isn’t going anywhere in a day, physiologically speaking. I’ll hit the cardio tomorrow. How important are social networks to your happiness? Perhaps even more important than you realized. A recent 20-year study of more than 4,000 people showed that happiness is influenced not just by your immediate friends and family. The happiness of a friend of a friend of a friend – someone you’ve never even met – can also influence your happiness. It turns out that happiness can spread through social networks, like a virus. “If you have such a huge ego, you’re setting yourself up as a huge target, which can easily get hit,” Jinpa says. But using a “wide-angle lens” instead helps you see connections you wouldn’t otherwise see, such as the universality of suffering. All it may take is having a loved one diagnosed with a serious disease to realize how many people are grappling with similar challenges. Feeling joined by others on this journey provides some comfort and happiness. The straightest path to making connections like these? Compassion and caring for others. Even primates seem to understand this, says Robert M. Sapolsky, PhD, author of Why Zebras Don’t Get Ulcers and research associate with the Institute of Primate Research at the National Museum of Kenya. Primates that groom each other after a stressful event experience a reduction in blood pressure. The clincher? Grooming others has a greater impact than getting groomed, says Sapolsky. I’m a social hermit and I navel gaze more than I realized. When I read that article, I started thinking about that “contagion” and how I contribute to other people’s happiness. Not that I am responsible for how other people feel in general, but my actions and words certainly can enhance or derail someone’s moment, and that can spread into their entire day. Did I respond the most effective way I could to an email? Did I sincerely thank the cashier or car wash attendant I encountered today? Did I reach out to someone who needed a helping hand? I’m more inclined to thank people, offer a smile to strangers, or write more compassionately after encountering a happy moment, like today with Claire. But I want to be more compassionate in those moments when it’s snowing, so to speak, and when I’m not so happy. I don’t want to be a navel gazer, especially considering my navel isn’t much to gaze at – lol. If you’re happy and you know it, how do you show it? If you’re not happy, how do you get happy? What do you do to get past happiness barrier #6: navel gazing? This entry was posted in Uncategorized on January 13, 2009 by Lynn Haraldson. I’m glad you posted that. Reaching out to others is a really positive way to help yourself stay healthy. By the way, that is one adorable baby girl! When I am unhappy, all I have to do is consider all that I am thankful for from the simple to to the big things and it makes whatever it is that is making me unhappy seem very slight. Carla, I giggled a little at your comment because it was YOU and your site that I was part of my thinking when I contemplated this bog entry. I see your site as the perfect example of online community, as the anti-navel-gazing place 😉 If you’re navel gazing, there’s no hope for me! LOL Moonduster, she’s a cutie, isn’t she? I’m glad you think so, too 🙂Terri, being grateful truly is away to stay happy. I always forget that, though, when I’m all in my little shell, you know? Very good Lynn. I definitely agree that we all still need to interact with ‘flesh and blood’ people, in spite of the great community we have here on the internet. It’s so easy to become isolated (especially in winter)- even with all the high tech gadgets that were designed to keep us in the loop. Oh, the irony. Still, there is nothing like the human touch to keep us truly connected. Great post.